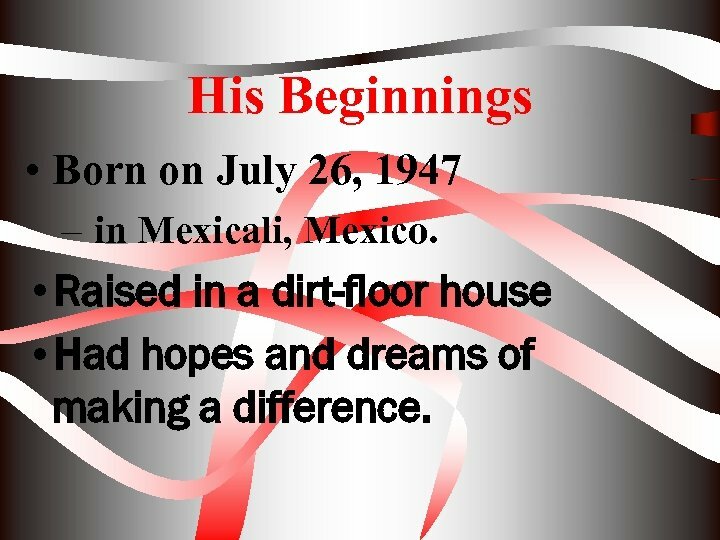 His Beginnings • Born on July 26, 1947 – in Mexicali, Mexico. • Raised in a dirt-floor house • Had hopes and dreams of making a difference. 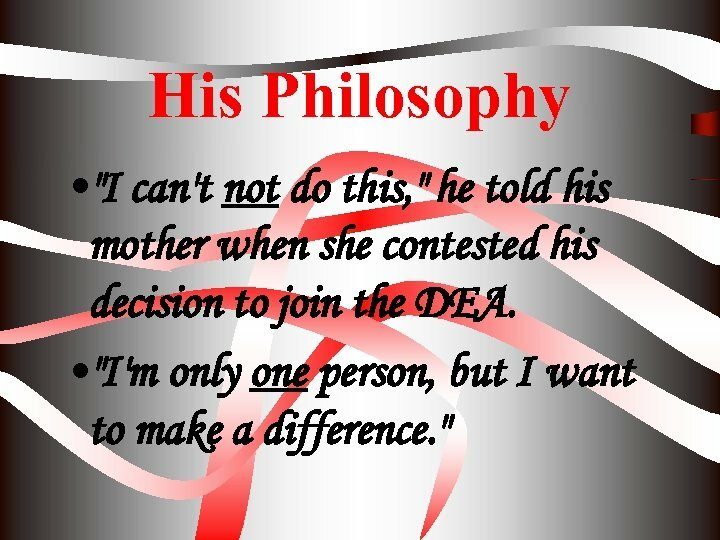 His Philosophy • "I can't not do this, " he told his mother when she contested his decision to join the DEA. • "I'm only one person, but I want to make a difference. " 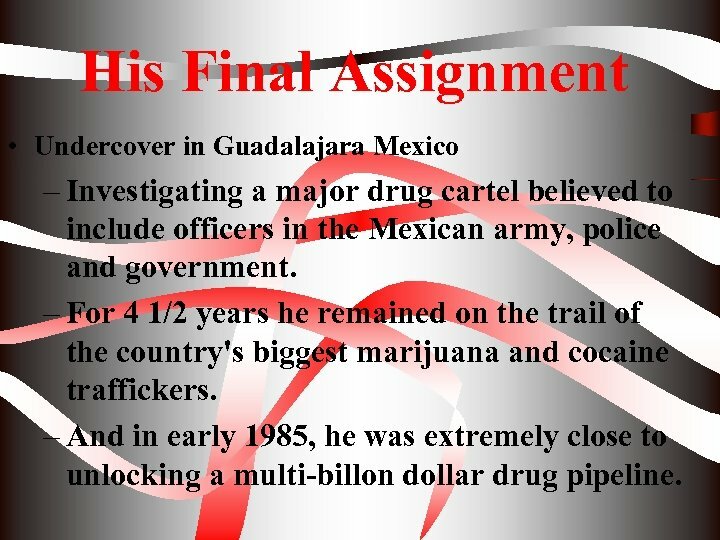 His Final Assignment • Undercover in Guadalajara Mexico – Investigating a major drug cartel believed to include officers in the Mexican army, police and government. 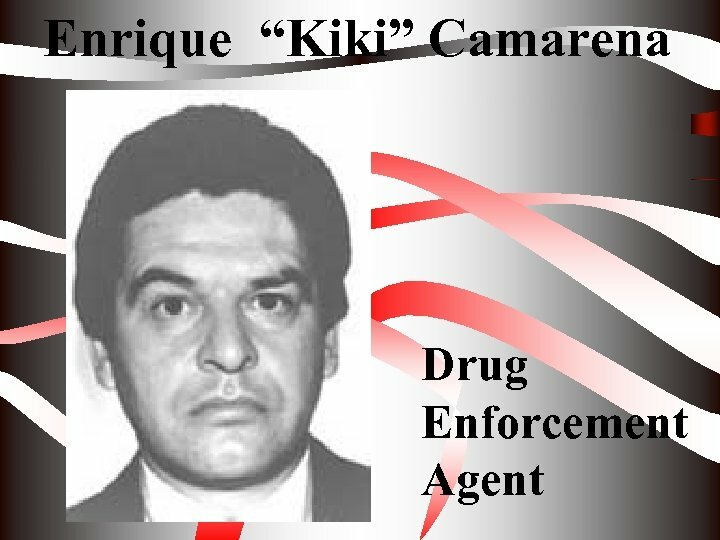 – For 4 1/2 years he remained on the trail of the country's biggest marijuana and cocaine traffickers. – And in early 1985, he was extremely close to unlocking a multi-billon dollar drug pipeline. 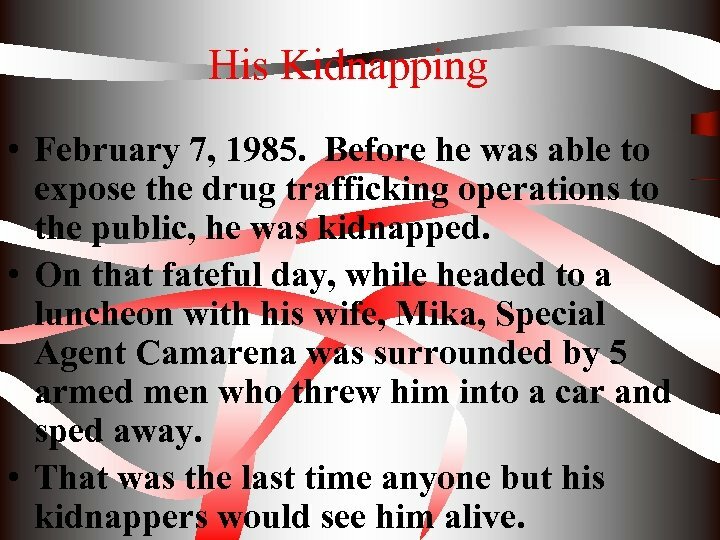 His Kidnapping • February 7, 1985. 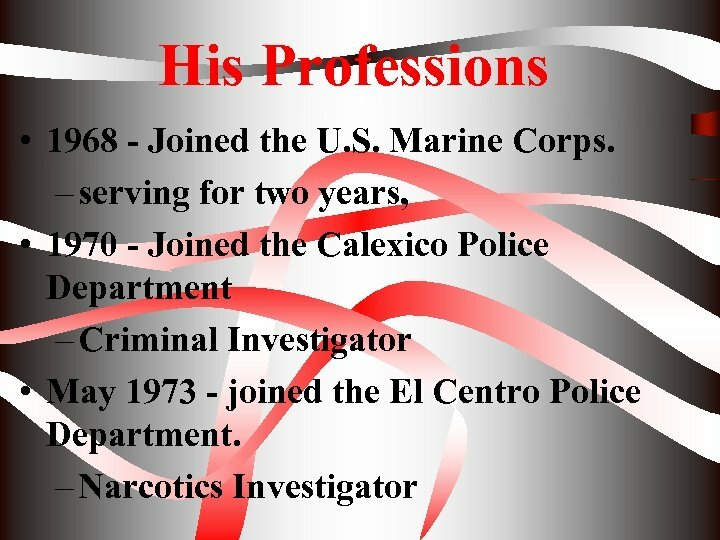 Before he was able to expose the drug trafficking operations to the public, he was kidnapped. 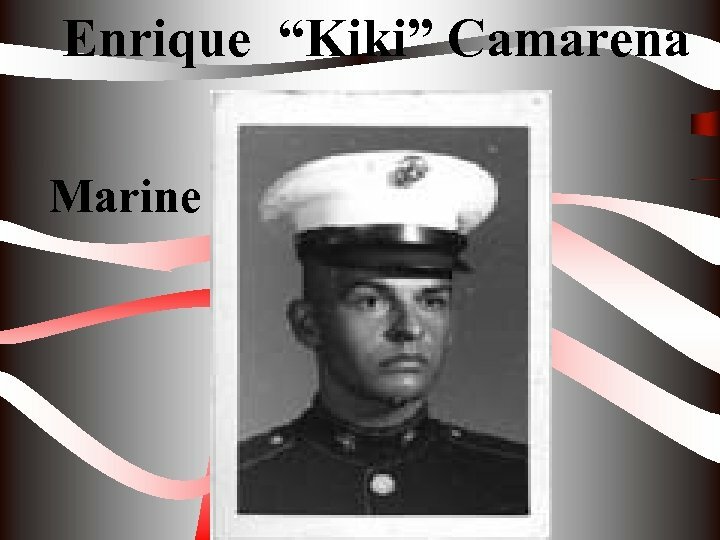 • On that fateful day, while headed to a luncheon with his wife, Mika, Special Agent Camarena was surrounded by 5 armed men who threw him into a car and sped away. 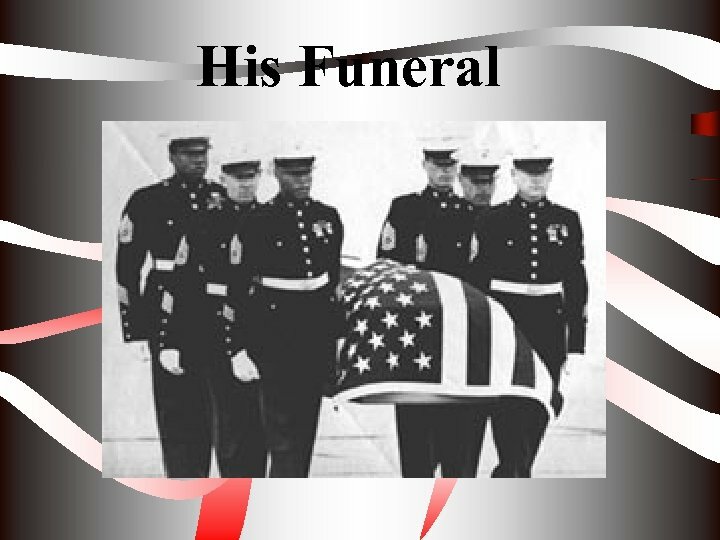 • That was the last time anyone but his kidnappers would see him alive. His Demise • One month later, Camarena's body was found in a shallow grave. He had been tortured to death. 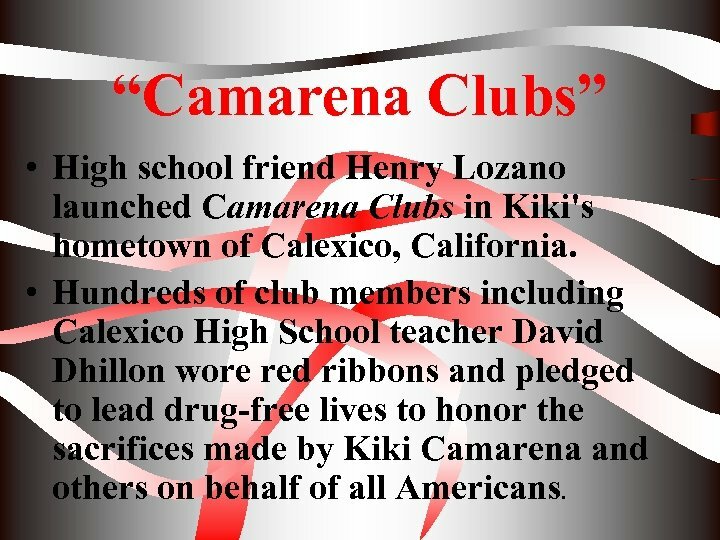 “Camarena Clubs” • High school friend Henry Lozano launched Camarena Clubs in Kiki's hometown of Calexico, California. 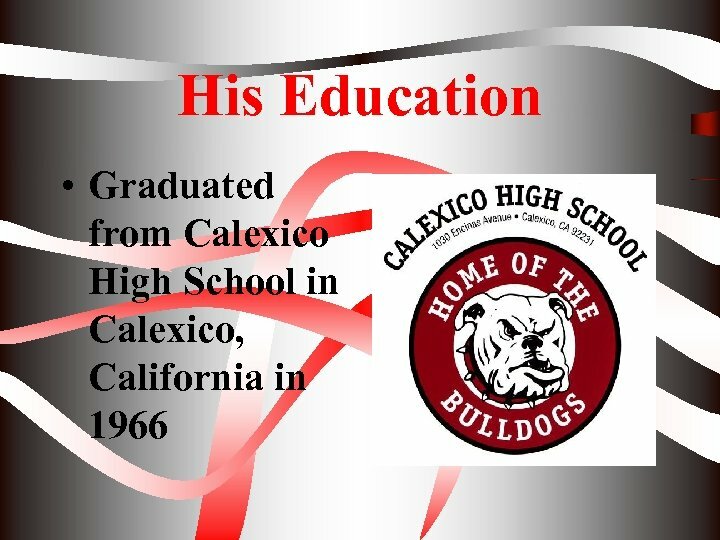 • Hundreds of club members including Calexico High School teacher David Dhillon wore red ribbons and pledged to lead drug-free lives to honor the sacrifices made by Kiki Camarena and others on behalf of all Americans. 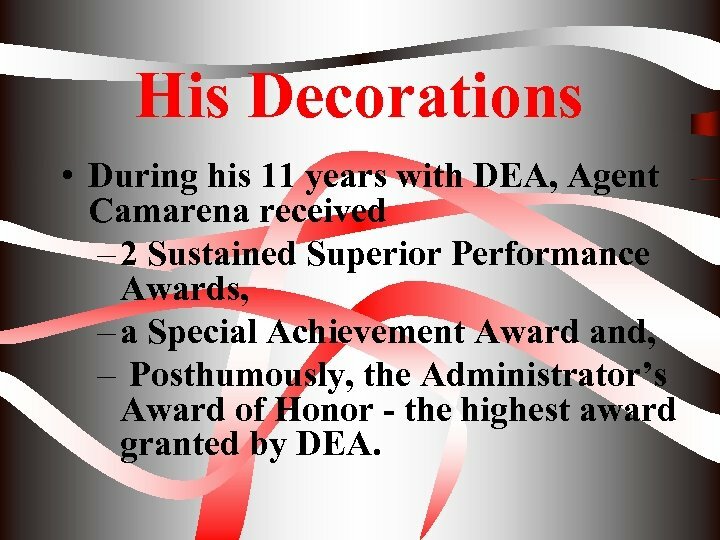 His Decorations • During his 11 years with DEA, Agent Camarena received – 2 Sustained Superior Performance Awards, – a Special Achievement Award and, – Posthumously, the Administrator’s Award of Honor - the highest award granted by DEA. 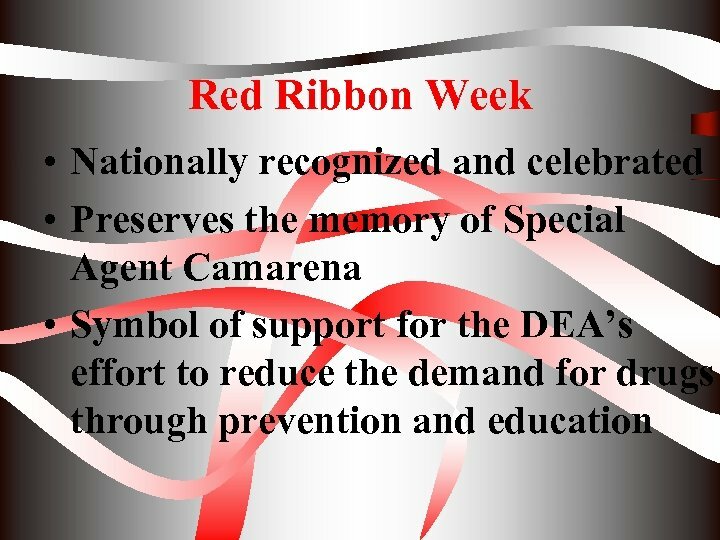 In His Honor • In honor of Agent Camarena's memory and his battle against illegal drugs, friends and neighbors began to wear red badges of satin. 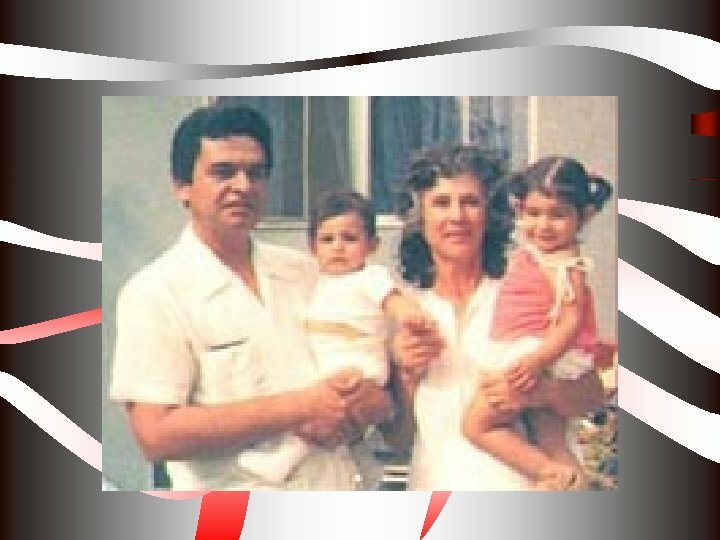 • Parents, sick of the destruction of alcohol and other drugs, had begun forming coalitions. • Some of these new coalitions adopted Agent Camarena as their model and embraced his belief that one person can make a difference. The Symbol • These coalitions also adopted the symbol of Agent Camarena's memory • The Red Ribbon. 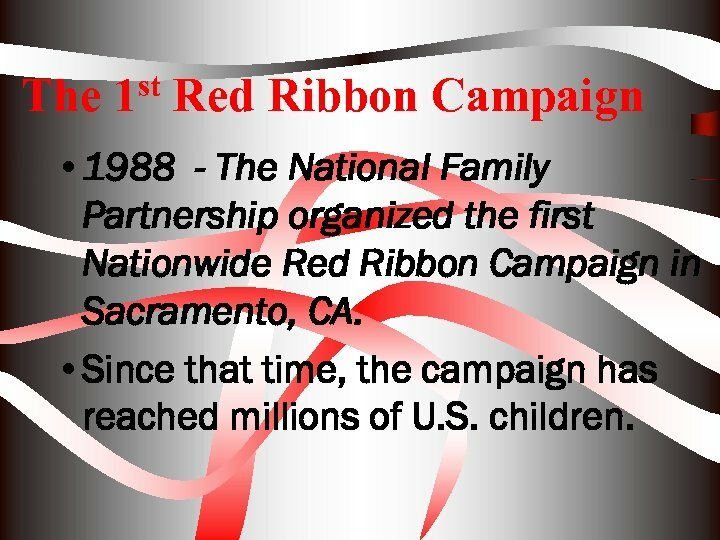 The 1 st Red Ribbon Campaign • 1988 - The National Family Partnership organized the first Nationwide Red Ribbon Campaign in Sacramento, CA. 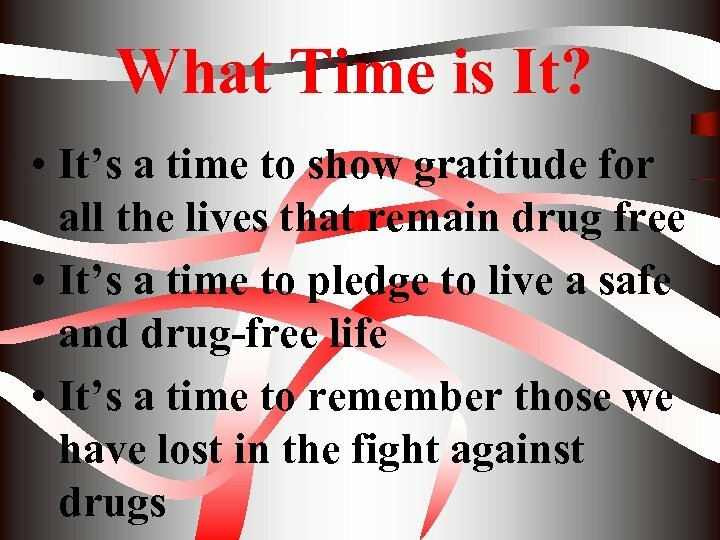 • Since that time, the campaign has reached millions of U. S. children. 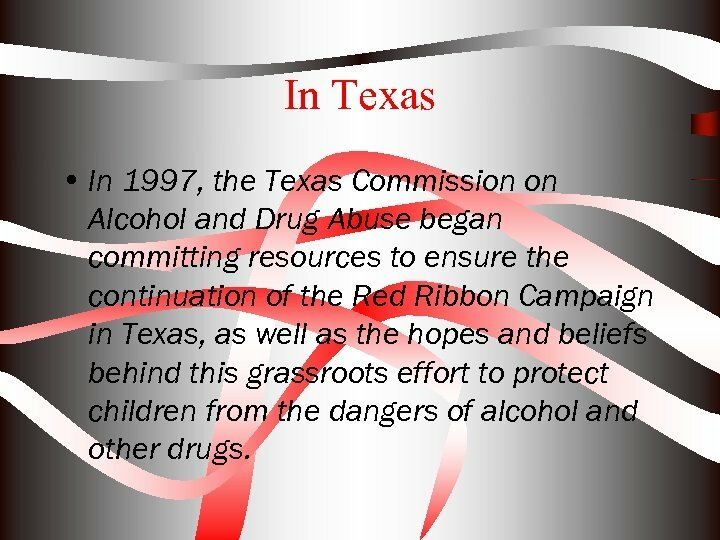 In Texas • In 1997, the Texas Commission on Alcohol and Drug Abuse began committing resources to ensure the continuation of the Red Ribbon Campaign in Texas, as well as the hopes and beliefs behind this grassroots effort to protect children from the dangers of alcohol and other drugs.